In a not-so-subtle act of defiance against the contentious Christopher Columbus, someone in Detroit celebrated Columbus Day this year by taping an ax to a bust commemorating the explorer, splashing on some red paint for full dramatic effect, the Detroit Free Press reported. When does art become a symbol for the subject of the art? 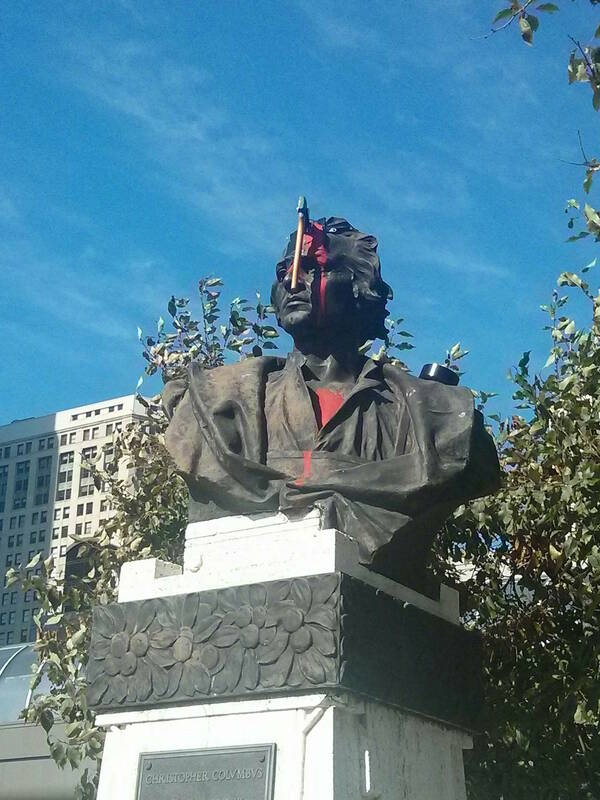 Are we defacing a guy named Columbus or the artist who made the statue? Or are we supporting the defacing of something else? An idea? If so, are there more effective ways of expressing that idea than vandalism? Or perhaps, is art itself, a form of vandalism? I find history and memory fascinating as subjects for contemplation and conversation. According to scientists who study the mind, when we remember something, we are actually only remembering the memory of the last time we remembered the original memory. This reallocation of memory is what allows people to imprint their own meanings on history. Each time we remember we erase our previous memory and replace it with a new, slightly altered version. This he said/she said telephone relay from memory to memory distorts our memories until they are only vaguely related to the original. They only seem true to us. But in reality, our memories simply can’t be trusted. History is fluid and heavily influenced by our present. When we obsess over traumatic memories, we repeatedly create more and more distortions – often in the form of conflict and turmoil, which compound the trauma – until the original memory is unrecognizable. It is almost as impossible to get an accurate picture of the past as it is to get an accurate picture of the future. Psychologists aid sufferers of trauma by helping them to re-frame terrible memories. My first memory is of being left alone in my crib by my mother, who assumed a sitter was on her way. The sitter never showed up. I used to re-member the memory as trauma, playing the tape of me trying to stuff my feces back into my diaper, smearing it on the walls above my crib, shamed and abandoned. My therapist help me turn it into my first art experience. Clearly, the stories of history tend to bend heavily toward our various current political views. I think if we are to learn from history, and perhaps evolve as a species, we need to see history in the light of what we understand today. But to truly understand our past, we must recognize the perspectives of those who lived in that time, which for reasons cited above, is a nearly impossible task. As to whether or not all art is vandalism, those who like to put things in neat little categories might simply say “no.” But I rather enjoy the ambiguity in the age-old question, “what is art?” All I know, is that without some element of danger, there is little impact. Destruction is a necessary function of any creative process. After all, I destroy perfectly good paints and canvas, not to mention my time, in order to make my art. One might even argue that the cost is not justified by the result. I’ll leave that to the historians to iron out.